Organizing and discussing Pathfinder Society games. Planning games at an individual venue should be posted within the forum for that venue. Okay I have Hero Labs and I find it much easier on me to use it to make Pathfinder PC's for my wife and myself then using the hard cover books. BUT here is the issue. I have a ton of the content for 'NORMAL' games but want to make a template for CORE creation that ONLY has checked what should be checked for CORE PC's. Having said that I think I am good but would LOVE if someone more 'into it' that I could post what ONLY should be or could be checked. 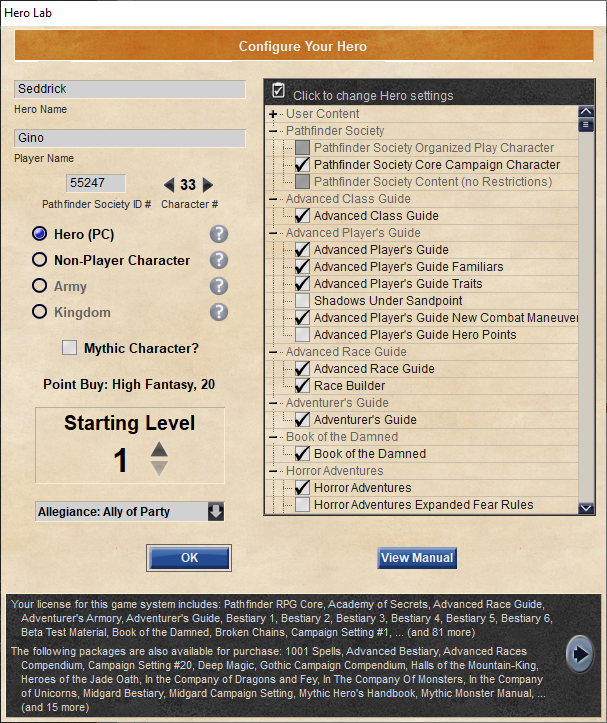 Basically there are options for what to show I have picked others may not.. so in the end advice would be greatly appreciated..
You want to check Character->Configure Hero->Pathfinder Society->Pathfinder Society Core Campaign Character. So hold day boat... you saying the items it 'checks' or boxes that are NOT grey such as 'advanced players guide' are allowed in core? *Update on my Mom-in-law* we just brought her home yesterday.. turns out she had a mild 'stroke' in her left eye. She is doing much better but it will be a few days till we are comfortable leaving her alone at home. So there are two parts of HL, the list of sources, and the list of things in HL. The list of sources just populates the list of things. When viewing the List of things (Classes, feats, magic items, gear. ect) non-legal items get greyed out. Take the original summoner class from the Advanced Player's Guide. Regardless of what you have checked, its greyed out as not legal, same thing goes for the anti-paladin, which while not explicitly a banned class, is banned because of the required evil alignment.